SWBAT describe the relationship between atmospheric carbon dioxide, ocean surface levels and water vapor in terms of a positive feedback loop. How does the amount of water vapor in the atmosphere effect atmospheric temperatures? Students are familiar with linear cause and effect relationships but may not be familiar with feedback loops. In this lesson I continue to use simulations from High Adventure Science. Students will use a model to learn about positive feedback loops in the context of climate change. In this case the positive feedback loop shows how climate change could spin out of control. This lesson challenges student thinking, helping them move beyond simple linear relationships to an understanding of complex interactions. The High-Adventure Science - Activity 3 Sources, Sinks, and Feedback presents to students a short written explanation along with simulations so students can manipulate variables to see the effect of change in a system. Boxes are provided for students answers. As the facilitator of this activity, I can run a report at any time to view student responses for all students, one student, all questions or one question. "Sources, Sinks, and Feedbacks" High-Adventure Science. Concord Consortium, 2015. Web. 23 May 2015. The following example of positive feedback yielding results is explained in the last section of Sources, Sinks, and Feedbacks. I use it to prime students minds to look for a feedback example within the lesson. In addition to exploring climate change, this is the first encounter my students have had with the concept of feedback loops. The strategy here is to activate their own knowledge of a simple feedback system (grades) so they are better able to connect to the more complex interactions caused by a positive feedback system in the context of climate change. What happens when you study for a test? You get a better grade, you know the answers. How does that make you feel when you study and you get a good grade on your test? Great. Studying does help me remember the information. How likely are you to study for the next test? Very likely. 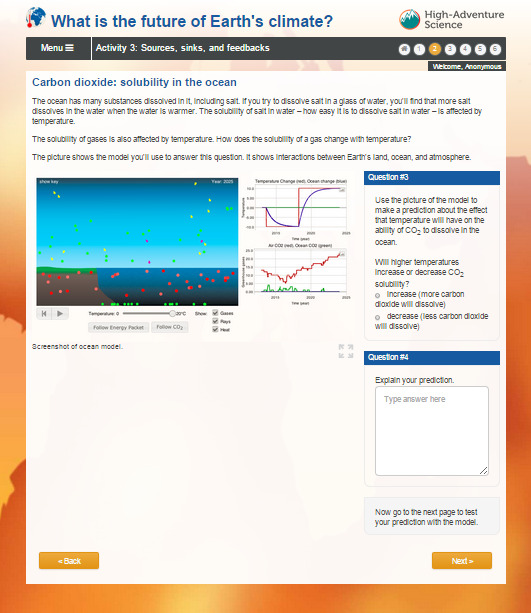 In this lesson you will examine what happens when variables other than simply carbon dioxide change within system. Think about how these variables are interrelated and what effect they have on the system. In the resources section you will find a Student Sample generated at the end of each section. My students select the print option and select PDF as their printer. The PDF responses are then shared with me via Google Drive. In this video, I share one of the many report options available to educators on the High-Adventure Science site. This report helps me address the needs of my students. As I look at the various reports from High Adventure Science, I note which students could use some direct instruction. Perhaps they missed the big idea or seem to be heading in the wrong direction and need some guidance. There is a table in my classroom I use for conferences. I ask a group of students to conference with me while the others are engaged in the lesson at hand. I let students know, that we are meeting to clarify the understanding of a particular point or question in the unit. The scope of the conference is such that we do not spend more than 5 minutes in discussion. The conference is focused on a very specific point of understanding. I may want to clarify, for instance, that in this unit the term feedback relates to a chain or cause and effect relationships not how someone feels about a particular issue. I limit the conferences to 1 or 2 per class period. It is not uncommon that I meet with small groups students at various times throughout the year. During PBL (Project-Based Learning) students create a Need-to-Know list. Using students' Need-to-Know lists, I develop mini workshops or lessons to answer their questions. Only those students who require a workshop or mini lesson attend others go on with their work. Whatever the reason for the conference, I limit the participants to 5 or fewer students. Once the number is larger than 5, I address topics with a whole class discussion. So what are the other students doing during the conferences? They are working. We do this often and students know that the expectation is that they will continue on course during the class. After a conference, I circulate around the room checking on student progress. I ask questions about their work, "What did you learn from this map? Why is it important that we study..."
Students know that I will be asking questions above and beyond the lesson questions and are prepared. This expectation has been set from practice since the beginning of the school year. It is not a problem with this unit especially because my students find the simulations to be challenging and engaging. Another strategy that keeps students on task is self-selected seating. I let students select their seats and work with their friends admonishing them that friends do not let friends get into trouble. Students off task will be moved to a new location in the classroom. I find that for my students this is highly motivating. One of my classes was recently observed by a vendor. My students were working independently on that day's lesson and he asked how students liked the format of the class. I suggested that he ask the students. The first group replied that they knew I trusted them to do their work. They liked that I showed them respect, helping when needed and allowing them to work together. Time, practice and understanding that being off task has consequences helps students self-manage during conferences. I really want to make sure students understand the concept of feedback loops. This short video from TEDEd is a great overview of both positive and negative feedback loops. I am sharing this video with students after the lesson as I want them to first construct their understanding of a positive feedback loop in the context of climate change then expand their understanding with examples of positive and negative feedback loops in nature.